Objective: To determin the chemical compounds of Mentha suaveolens (M. suaveolens) and Pinus halepensis (P. halepensis) essential oils (Eos) and evaluate their antioxidant and antibacterial activities. Methods: The chemical composition of P. halepensis and M. suaveolens EOs was determined by GC-MS analysis. The antioxidant activity was evaluated using DPPH, ABTS and FRAP assays. The antibacterial effect was tested against 6 bacterial strains using the well diffusion method and micro-dilution assay. Results: The major components of P. halepensis EOs were β-caryophyllene (28.04%), myrcene (23.81%) and α-pinene (12.02%). However, piperitenone oxid (56.28%), piperitenone (11.64%) and pulegone (6.16%) were the major components of M. suaveolens EOs. M. suaveolens EOs showed remarkable antioxidant activities compared with P. halepensis EOs, showing antioxidant capacity values of IC50=(64.76±2.24) μg/mL, IC50=(82.73±3.34) μg/mL, and IC50=(93.35±4.45) μg/mL, revealed by DPPH, ABTS and FRAP assays, respectively. However, P. halepensis EOs showed interesting antibacterial effects against all bacterial strains. The most sensible strains to P. halepensis EOs were Staphylococcus aureus [(34.00±0.50) mm], Listeria monocytogenes [(31.00±1.50)] mm and Proteus mirabilis [(29.00±2.25)mm]. Furthermore, the lowest minimal inhibitory concentration (MIC) and minimal bactericidal concentration (MBC) values were revealed by P. halepensis EOs against Staphylococcus aureus [MIC=MBC=0.125% (v/v)] and Listeria monocytogenes [MIC=MBC=0.25% (v/v)]. Conclusions: P. halepensis and M. suaveolens EOs contain bioactive compounds that could have potential applications against bacterial infections and oxidative stress related diseases as well as for food conservation. However, further investigations are necessary to isolate and investigate the action mechanisms of these bioactive compounds. Foundation project: This study was supoorted by le Centre National pour la Recherche Scientifique et Technique et l'Agence Nationale des Plantes Médicinales et Aromatiques. The chemical composition of P. halepensis and M. suaveolens EOs was identified using GC-MS [Figure 1] and [Figure 2]. The obtained results are listed in [Table 1]. As shown, 20 compounds were identified in M. suaveolens EOs, while P. halepensis EOs contain 23 volatile compounds. The main compounds of P. halepensis EOs were β-caryophyllene (28.04%), myrcene (23.81%), α-pinene (12.02%), and caryophyllene oxide (6.78%). However, for M. suaveolens EOs, the main compounds were piperitenone oxide (56.28%), piperitenone (11.64%), and pulegone (6.16%). 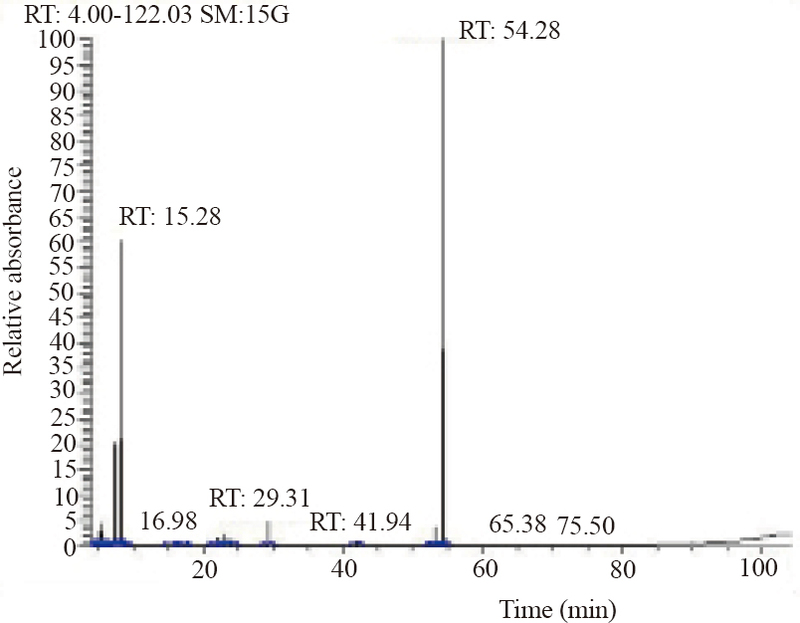 Figure 1: GC-MS analysis of P. halepensis essential oils. 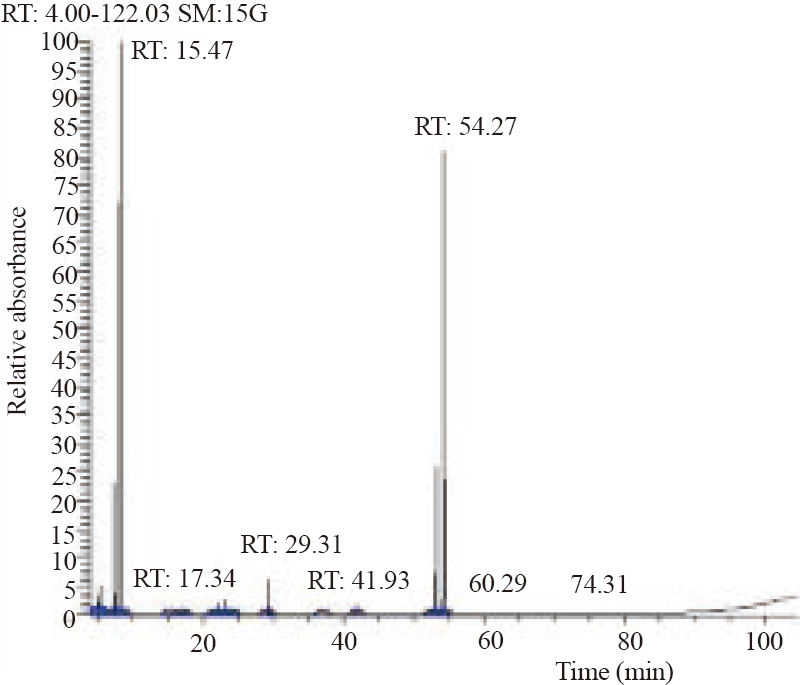 Figure 2: GC-MS analysis of M. suaveolens essential oils. 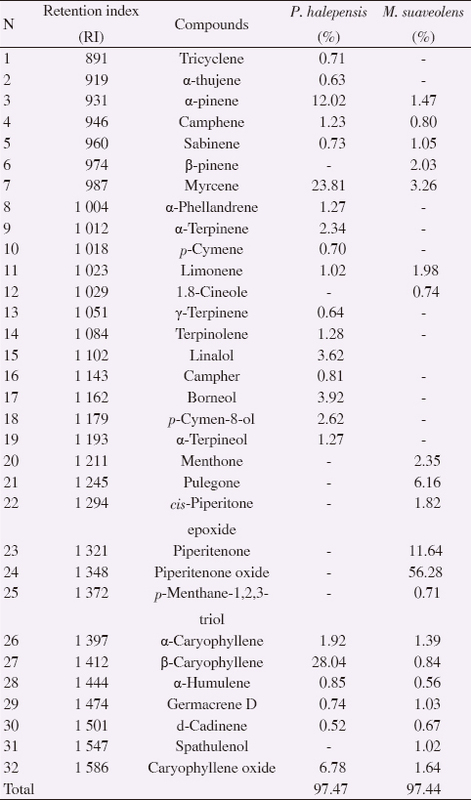 Table 1: Chemical composition of P. halepensis and M. suaveolens EOs. 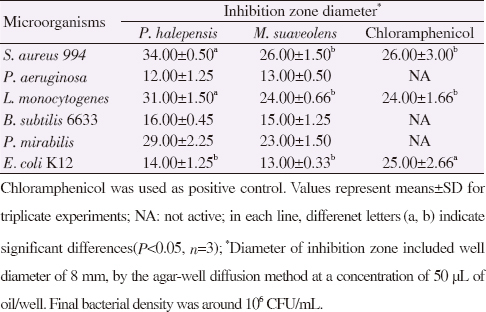 To evaluate the antioxidant effects of P. halepensis and M. suaveolens EOs, 3 complementary assays were used: DPPH scavenging activity assay, ABTS and FRAP tests, and in order to compare the obtained data, the results were expressed as IC50 values [Table 2]. As listed in the table, M. suaveolens EOs revealed higher antioxidant capacities than P. halepensis EOs. Indeed, M. suaveolens EOs showed antioxidant capacity values at IC50=(64.76±2.24) μg/mL, IC50=(82.73±3.34) μg/ mL, and IC50=(93.35±4.45) μg/mL using DPPH, FRAP and ABTS assays, respectively. Moreover, it has been noticed that the DPPH assay was more sensitive than FRAP and ABTS tests. Table 2: Antioxidant activities of P. halepensis and M. suaveolens EOs (μg/mL). The antibacterial activity of P. halepensis and M. suaveolens EOs was evaluated against 6 bacterial strains using agar well diffusion assay. The obtained results were expressed as the diameters of inhibition around the wells [Table 3]. 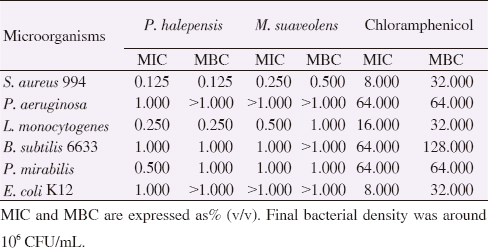 As summarized in the table, P. halepensis EOs showed a higher antibacterial effect than M. suaveolens EOs against some strains. Indeed, P. halepensis EOs exhibited remarkable inhibition of S. aureus, L. monocytogenes and P. mirabilis with inhibition zones of (34.00±0.50) mm, (31.00±1.50) mm and (29.00±2.25) mm, respectively. These effects were higher than those obtained with chloramphenicol. For the determination of the MIC and MBC, the micro-dilution assay was used. The obtained results were listed in [Table 4]. As shown, P. halepensis EOs demonstrated remarkable inhibition of S. aureus [MIC=MBC=0.125% (v/v)] and L. monocytogenes [MIC=MBC=0.25% (v/v)]. However, M. suaveolens EOs showed an antibacterial inhibition at moderate concentrations. Table 3: Antibacterial activity of P. halepensis and M. suaveolens EOs using agar-well diffusion assay (mm). Table 4: P. halepensis, M. suaveolens EOs, and chloramphenicol (μg/mL) against 6 human pathogen bacteria strains tested by microdilution assay. Lobo V, Patil A, Phatak A, Chandra N. Free radicals, antioxidants and functional foods: Impact on human health. Pharmacogn Rev 2010; 4: 118-126. Bouyahya A, Dakka N, Et-Touys A, Abrini J, Bakri Y. Medicinal plant products targeting quorum sensing for combating bacterial infections. Asian Pacific J Trop Med 2017; 10: 729-743. Bakkali F, Averbeck S, Averbeck D, Idaomar M. Biological effects of essential oils-a review. Food Chem Toxicol 2008; 46: 446-475. Lahlou M. The success of natural products in drug discovery. Pharmacol Pharm 2013; 4: 17-31. Bouyahya A, Abrini J, Et-Touys A, Bakri Y, Dakka N. Indigenous knowledge of the use of medicinal plants in the North-West of Morocco and their biological activities. Europ J Integ Med 2017; 13: 9-25. Bouyahya A, Dakka N, Talbaoui A, Et-Touys A, El-Boury H, Abrini J, et al. Correlation between phenological changes, chemical composition and biological activities of the essential oil from Moroccan endemic Oregano (Origanum compactum Benth). Indust Crops Prod 2017; 108: 729-737. El Bouzidi L, Almaoui JC, Bekkouche K, Hassani L, Wohlmuth H, Leach D, et al. Chemical composition, antioxidant and antimicrobial activities of essential oils obtained from wild and cultivated Moroccan Thymus species. Ind Crops Prod 2013; 43: 450-456. Bouhdid S, Skali SN, Idaomar M, Zhiri J, Baudoux A, Abrini J. Antibacterial and antioxidant activities of Origanum compactum essential oil. Afr J Biotech 2008; 7: 1563-1570. Bouhdid S, Abrini J, Zhiri A, Espuny MJ, Manresa A. Investigation of functional and morphological changes in Pseudomonas aeruginosa and Staphylococcus aureus cells induced by Origanum compactum essential oil. J Appl Microbiol 2009; 106: 1558-1568. El-Kashoury EA, El-Askary HI, Kandi ZA, Ezzat SM, Salem MA, Sleem AA. Chemical and biological study of Mentha suaveolens Ehrh. cultivated in Egypt. J Med Plants Res 2014; 8: 747-755. Kasratia A, Alaoui JC, Bekkouche K, Spooner-Hart R, Leach D, Abbad A. Chemical characterization and insecticidal properties of essential oils from different wild populations of Mentha suaveolens subsp. timija (Briq.) harley from Morocco. Chem Biodiv 2015; 12: 823-831. Nam AM, Tomi F, Gibernau M, Casanova J, Bighelli A. Composition and chemical variability of the needle oil from Pinus halepensis growing in Corsica. Chem Biodivers 2016; 13: 380-386. Djerrad Z, Djouahri A, Kadik L. Variability of Pinus halepensis Mill. Essential oils and their antioxidant activities depending on the stage of growth during vegetative cycle. Chem Biodivers 2017; doi: 10.1002/ cbdv.201600340. Llorens-Molina JA, Rivera Seclén CF, Vacas Gonzalez S, Boira Tortajada H. Mentha suaveolens Ehrh. chemotypes in Eastern Iberian Peninsula: Essential oil variation and relation with ecological factors. Chem Biodivers 2017; doi: 10.1002/cbdv.201700320. Dob T, Berramdane T, Chelgoum C. Chemical composition of essential oil of Pinus halepensis Miller growing in Algeria. Comp Rend Chim 2005; 8: 1939-1945. Aboukhalid K, Lamiri A, Agacka-Moldoch M, Doroszewska T, Douaik A, Bakha M. Chemical polymorphism of Origanum compactum grown in all natural habitats in Morocco. Chem Biodiv 2016; 13: 1126-1139. Taïbi K, del Campo AD, Vilagrosa A, Bellés JM, López-Gresa MP, Pla D, et al. Drought tolerance in Pinus halepensis seed sources as identified by distinctive physiological and molecular markers. Front Plant Scien 2017; 8: 1202. Taïbi K, Del Campo AD, Vilagrosa A, Bellés JM, López-Gresa MP, López-Nicolás JM, et al. Distinctive physiological and molecular responses to cold stress among cold-tolerant and cold-sensitive Pinus halepensis seed sources. BMC Plant Biol 2018; 18: 236. Avramova Z. Transcriptional memory of a stress: Transient chromatin and memory (epigenetic) marks at stress-response genes. Plant J 2015; 83: 149-159. Vriet C, Hennig L, Laloi C. Stress-induced chromatin changes in plants of memories, metabolites and crop improvement. Cell Mol Life Sci 2015; 72: 1261-1273. Lahlou S, Ferreira R, Carneiro-Leão L, Leal-Cardoso JH, Toscano CF. Cardiovascular effects of the essential oil of Mentha x villosa and its main constituent, piperitenone oxide, in normotensive anaesthetised rats: Role of the autonomic nervous system. Planta Med 2001; 67: 638-643. Sousa PJC, Linard CFBM, Azevedo-Batista D, Oliveira AC, Coelho-de-Souza AN, Leal-Cardoso JH. Antinociceptive effects of the essential oil of Mentha x villosa leaf and its major constituent piperitenone oxide in mice. Braz J Med Biol Res 2009; 42: 655-659. Flamini G, Cion PL, Puleio R, Morelli I, Panizz L. Antimicrobial activity of the essential oil of Calamintha nepeta and its constituent pulegone against bacteria and fungi. Phytother Res 1999; 13: 349-351. Vadiraja BB, Gaikwad NW, Madyastha KM. Hepatoprotective effect of C-phycocyanin: Protection for carbon tetrachloride and R-(+)-pulegone- mediated hepatotoxicty in rats. Biochem Biophys Res Commun 1998; 249: 428-431. Fidyt K, Fiedorowicz A, Strz dała L, Szumny A. Β-caryophyllene and β-caryophyllene oxide-natural compounds of anticancer and analgesic properties. Cancer Med 2016; 5: 3007-3017. Ghelardini C, Galeotti N, Di Cesare Mannelli L, Mazzanti G, Bartolini A. Local anaesthetic activity of beta-caryophyllene. Farmaco 2001; 56: 387-389. Vijayalaxmi A, Bakshi V, Begum N, Kowmudi V, Naveen Kumar Y, Reddy Y. Anti-arthritic and anti inflammatory activity of beta caryophyllene against freund’s complete adjuvant induced arthritis in wistar rats. J Bone Rep Recommend 2015; 2: 1-10. Rivas da Silva AC, Lopes PM, Barros de Azevedo MM, Costa DC, Alviano CS, Alviano DS. Biological activities of α-pinene and α-pinene enantiomers. Molecules 2012; 17: 6305-6316. Sitzmann J, Habegger R, Schnitzler WH, Grassmann J. Comparative analysis of antioxidant activities of fourteen mentha essential oils and their components. Chem Biodivers 2014; 11: 1978-1989. Dahham SS, Tabana YM, Iqbal MA, Ahmed MB, Ezzat MO, Majid AS, et al. The anticancer, antioxidant and antimicrobial properties of the sesquiterpene β-caryophyllene from the essential oil of Aquilaria crassna. Molecules 2015; 20: 11808-11829. Cox SD, Mann CM, Markham JL, Bell HC, Gustafson JE, Warmington JR, et al. The mode of antimicrobial action of the essential oil of Melaleuca alternifolia (tea tree oil). J Appl Microbiol 2000; 88: 170-175. Kaplan M, Mutlu EA, Benson M, Fields JZ, Banan A, Keshavarzian A. Use of herbal preparations in the treatment of oxidant mediated inflammatory disorders. Ther Med 2007; 15: 207-216.